Aren't they adorable? I just think cipolline are the cutest. Often called cipollini onions for their oniony appearance and flavor, cipolline are actually the underground bulb of grape hyacinth, a flower native to Italy. Cipollini bulbs are small and flat, and are usually harvested in the fall, and are available primarily in specialty markets through winter and early spring. We've had such a cold spring that the roots have really stuck around in the greenmarkets (although the cold is also affecting spring crops like lettuce and arugula - I talked to Zaid of Norwich Meadows Farm, which supplies our CSA from June to November, and he told me that everything is coming along slowly, despite the tremendous quantity of rain we've had (which is an improvement over last year's drought). This slowness to grow is reflected in my timid little fire escape garden. Anyway, cipollini are still around, and here's a simple, aesthetic, and delicious way to prepare them. This recipe is from Olive Oil: From Tree to Table by Peggy Knickerbocker, which was a gift from my mother on my birthday; it's a simple, informational cookbook about both the history of olive oil and cooking with it, and it has lovely photography...I imagine you'll be seeing it again on Pie in the Sky. 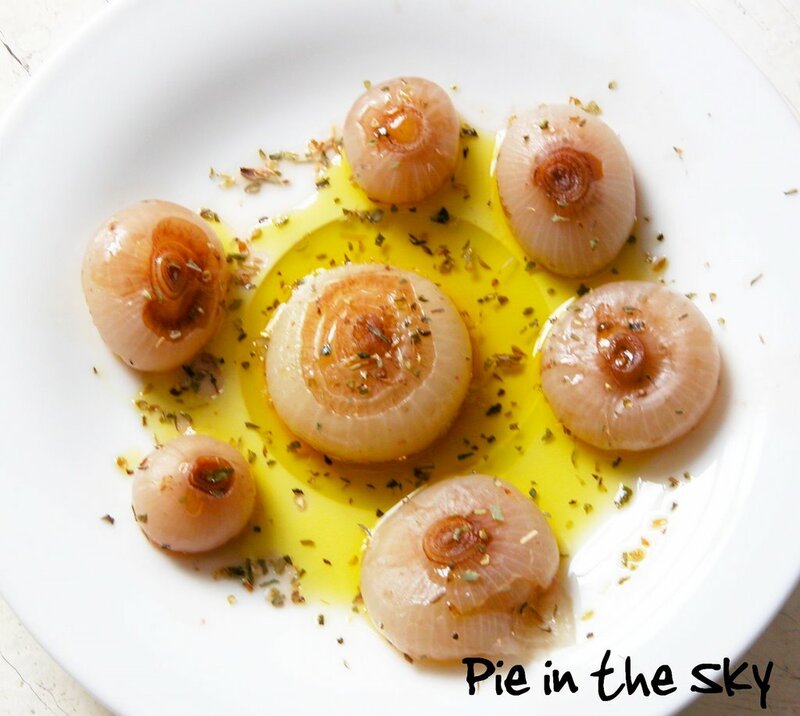 Cipolline en Agrodolce is excellent served as an appetizer (they have a tangy butteriness and are similar in texture to the onions in french onion soup) or as a vegetable accompaniment to a main course. Soak cipolline in chilled water for a few minutes to loosen their skins, then peel them with a small knife, removing top and bottom nubs. Put cipolline in a large pan with water to a depth of two inches. Bring to a simmer on medium heat and cook uncovered for 15 minutes. 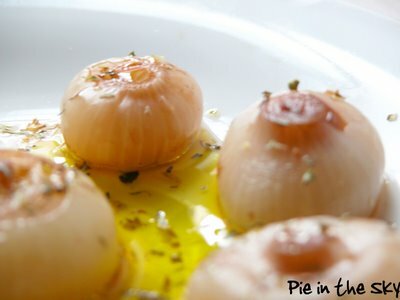 If the water evaporates, add more as needed to cover the onions. Stir in the vinegar, sugar, and salt. Reduce heat to low and simmer 40 minutes to an hour, adding more water as neccessary. Transfer to serving plate with slotted spoon. Drizzle with olive oil, sprinkle with oregano, and serve. Cook's note: The author's serving suggestions vary somewhat - she says to serve the cipollini in the remaining pan juices, but that's a lot of juice and I think it might be a bit overwhelming. Anyway, Peggy didn't serve the juices in her accompanying photograph! She also recommends letting the onions cool to room temperature before drizzling and serving...but I can't imagine why! What a beautiful post and the pictures are so lovely. I had no idea that cipolline were the were the root of the grape hyacinth! Now, that is a surprise to find those lovely grape hyacinth that come up very spring are the cipolline that are top dollar at Whole Foods. Your photo has grabbed me, I must make these. Cipollini and grape hyacinths are most definitely NOT the same thing--I grow both of them. Where did you get this idea? 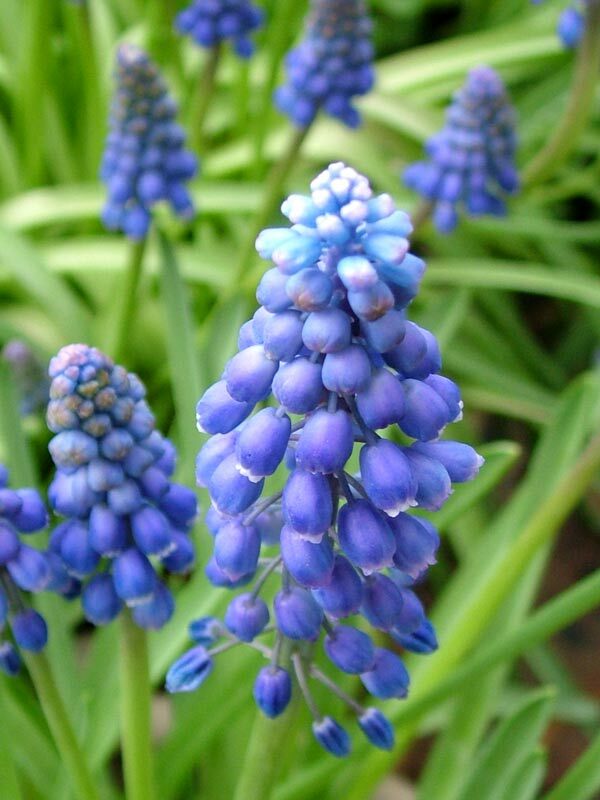 Perhaps you grow a different variety of grape hyacinth? very informative...I did not know that they were not onions! Cipolline or Cipollini are Italian terms that are not used to describe the grape hyacinth bulbs. I have growen cipolline,and they are onions...they are on the flat side and are sweet and very tasty. I have succesfully growen Muscari Comosum the only edible Grape Hyacinth bulb i know...there may be more. I have been growing such bulbs in the USDA Zone 5 and all i can say is...they are not Cipolline.I originate from Italy, where such bulbs are called Lampascioni, and depending on what part of Italy you are from or which form of dialect you speak, they are also called Cipollacce, Lampasciuni,Bambasciul,Vambasciul or even Lamponi,a term mostly used to describe raspberries.